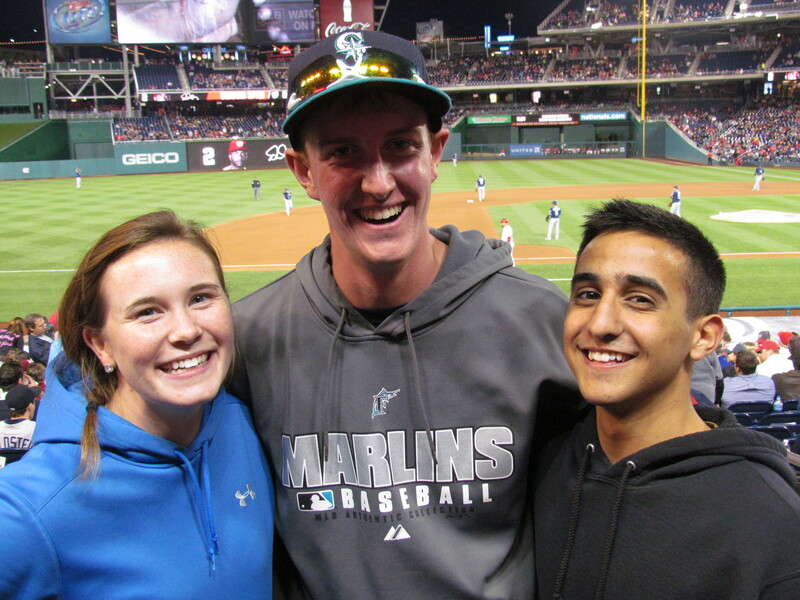 Back in September, I attended a Marlins-Nationals game with some friends–Ben, Jack, and Paul. We caught a lot of balls during batting practice, and had fun seat upgrading during the game. A week off of school and cheap Stub Hub tickets gave us an opportunity to get together for another night at Nationals Park. Unfortunately, Paul was out of town, so my pal André took his spot in this installment of Jack and the Beanstalks. I entered the stadium alone a little after 4:30, and made my way to the Red Porch. Ben and Jack waited outside the gates with Andre’s ticket while he walked back from the Navy Yard, where he parked. A lone baseball awaited me as I made my way down to the front row of the Porch and peered into the all-important gap in the wall. 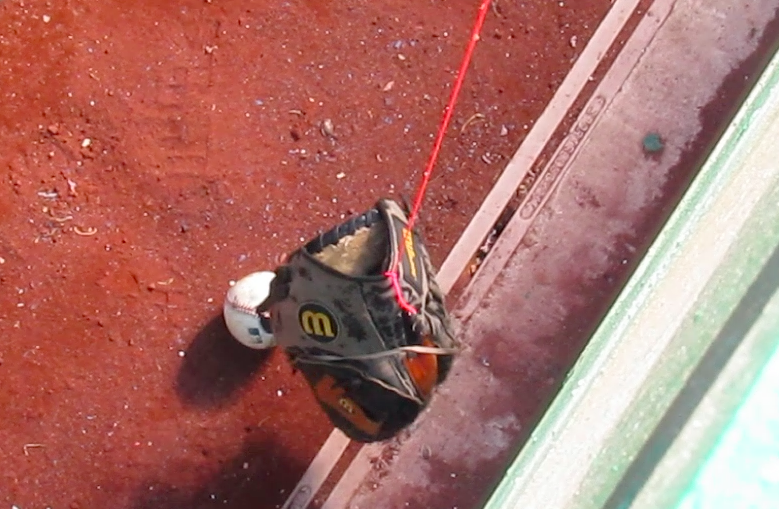 Back in September, the CSC security worker was mean to fans with ball retrieval devices, and in fact threatened to confiscate the glove of a fan who lowered it down to snag a ball. I looked around the section and the yellow-shirted worker was not present this time, so I went for it. After about 10 seconds, I had my first ball of the day. 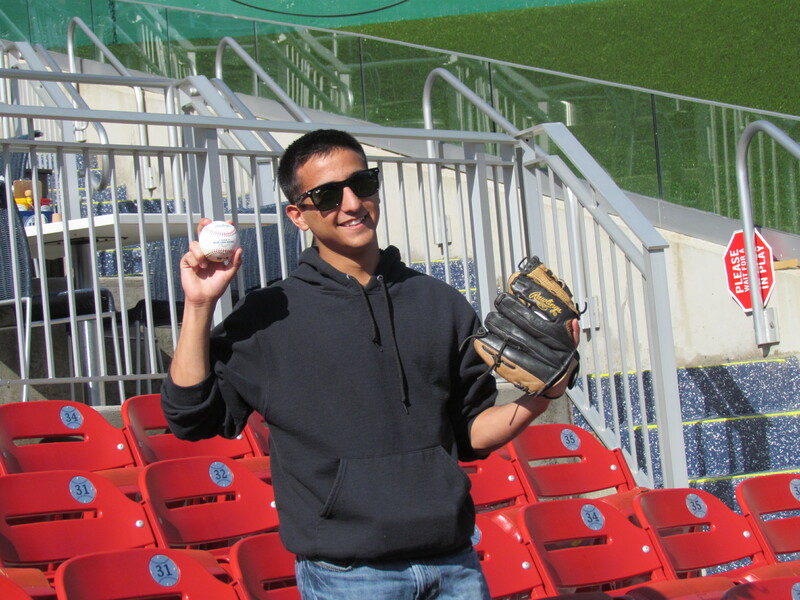 Almost immediately after, a Nationals righty drilled a fly ball in my direction. I didn’t even move my feet, and leaned out over the wall to make a clean catch. I turned around with my second ball and saw Ben, Jack, and Andre making their way down the steps. Party started. 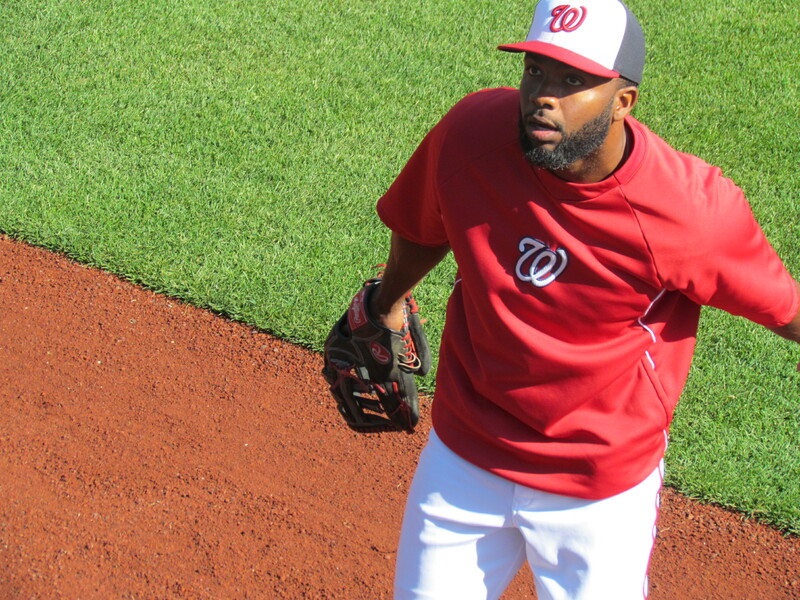 Denard Span was roaming in center field, and chucked a ball up to an older man in the front row of the seats. He juggled it and the ball ended up dropping into the gap. Span grabbed another and tossed it again. And again it dropped into the gap. I was at work setting up the glove trick when two ushers came down. Much to my delight, they were interested in how the contraption worked, and were too amused to even care about scolding me for creatively retrieving balls. The inconsistent rule enforcement at baseball stadiums absolutely dumbfounds me. I grabbed those two balls, handed one to the older guy and the other to Ben. If you’re counting at home, that’s four at this point. A few minutes later, a National crushed a home run into the restaurant at the back of the Red Porch. No fans seemed interested in chasing it, so I did. I raced up the steps and across a row of tables, grabbed it, and threw it down to Jack. We had five balls at this point, and had given one away. More fans started streaming into the section, making it relatively crowded but still easily navigable. Andre was standing in the front row next to a family with a few small kids when a Nat crushed a home run right to him. In fact, it was about the same place I was standing when I had caught mine. He caught it right in front of the kids, and handed it off to the one nearest him. The seventh and final ball of the day came when Gio Gonzalez chased down a fly ball right in front of us at the center field end of the Porch. I was standing in the second row, behind Ben and Jack. I asked him for it in Spanish and he tossed it up. Ben, being Ben, knocked it down right in front of my face and picked it up for himself. Way to go, bud! The Padres came out a few minutes later. And since no one knows almost any names of Padres players, toss ups were few and far between. Also, San Diego has an incredibly disproportionate amount of left-handed hitters. I kept waiting for a group of righties to come up to give us more home run catching opportunities, but none came. The right field seats were overly-crowded so we did not bother migrating. As the tweet above indicates, there was a “Benedict” snagging balls in center field. He was nowhere to be found in the program, but he’s neither the breakfast dish nor the former Bishop of Rome. As it turns out, he is the bullpen catcher and his name is Griffin. After a dull Padres BP, we walked around the concourse towards right field looking for a good place to get food. We kept walking, and ended up somewhere near home plate when Ben stopped a chef to ask where he should eat. The first four innings of the game went by super fast. There were quick outs, a few hits, and fast work by the pitchers. Fun side story: During the game I was texting my friend Kelly, whom I’ve known for a long time. She went to middle school with Jack and I, but isn’t really a baseball fan. I casually mentioned I was at the Nats game, and guess what. She was too. Whaaaaaaaaat?! Her dad has season tickets in the Stars and Stripes Club, so she came down and sat with us for a few innings. The row in front of us was empty also, which made spreading out and socializing easy. Ben and Jack ended up leaving for a while to get more food. Ben told me that if he was not back in 20 minutes, we should go looking for them. That didn’t happen. They were gone for at least half an hour, but we never got concerned. They had gone to Shake Shack, the hopping concession stand in the second deck of right field. Later on, Andre and I departed to get some more food. As soon as we were in the concourse above my section, Danny Espinosa hit a laser of a home run into the left field seats. It’s a running joke between me and my dad that whenever we go to the bathroom or otherwise depart our seats at any point during a dull game, we miss a home run. That held true this time even without my dad present. 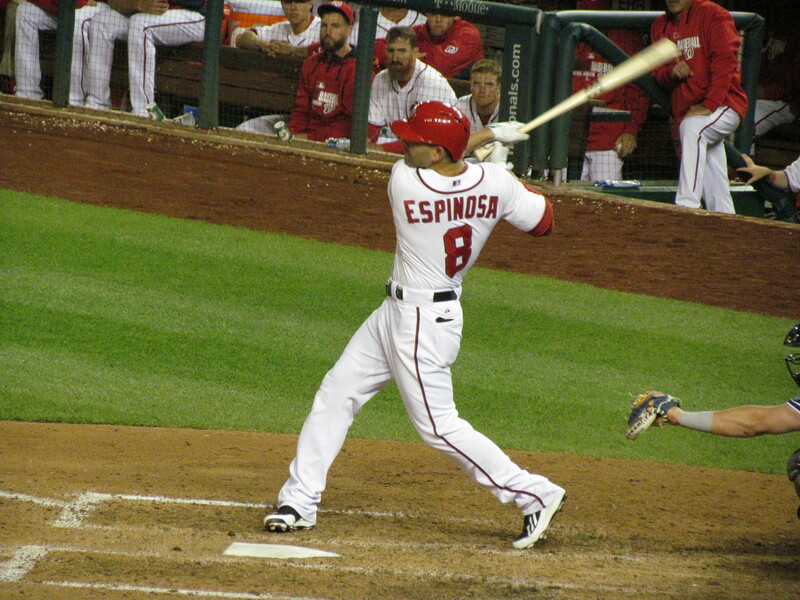 Espinosa’s blast cut the Nationals’ deficit to 3-2. I was not concerned with the outcome of this game, so I’m not recapping the play-by-play. 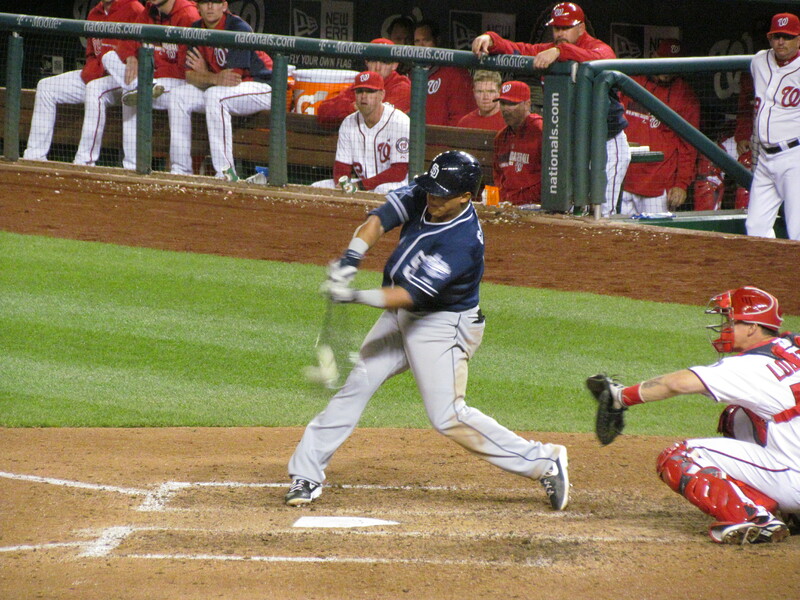 Each team had a sac fly in the first three innings, and then the Padres scored two on a double in the middle innings before Espinosa hit the homer. A little while after we returned to our seats, Adam LaRoche hit a solo shot of his own into the right field bullpen. It tied the game for the Nats, and set us up for extra innings! Andre got a text from his father at some point in the 10th inning or so. It indicated that the Navy Yard might close at 10:30, meaning we couldn’t get the car. I was almost certain that a guard was stationed all the time because my dad and I have parked at the Navy Yard for almost every game we’ve attended in DC. However, Andre did not buy any of my assurance, and tried to convince us to leave. But I wanted to stay until the end, and Ben and Jack were on my side. It was really funny seeing Andre so antsy, and if we had to spend the night in DC–so be it. In the top of the 12th, the Padres scored a run. That just about sealed the deal since the Nats could not hit anything at all, at least with runners on base. Bryce Harper led off the 12th for Washington, and skied a ball to left field. In spectacular fashion, San Deigo’s left fielder tripped and face planted. The ball dropped and Harper had a double. With no one out, the Nats were in business. 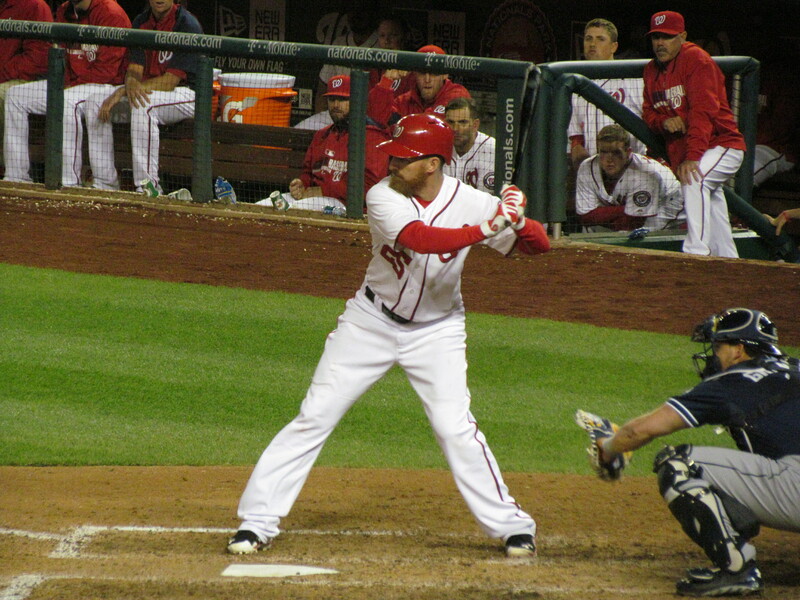 But after Tyler Moore struck out, Jose Lobaton lined a shot to shortstop. Everth Cabrera stretched to make a sweet backhanded catch. He promptly doubled off Harper at second to end the game. We made our way back to the Navy Yard, and we were in good shape. Andre’s dad was just playing a prank on him, and boy was he scared! But Andre played his own prank on us. As we advanced through the gates at the Yard, we passed the main parking garage where my dad normally parks. I asked, “Andre, where are you going? The garage is right there.” He responded, “I’m not supposed to park there.” I said, “No, there are non-reserved spaces on the top level.” He pretended not to hear it. For 10 minutes, we wound our way to the very back of the base. I saw a parking lot with a few cars in it, but we still weren’t there. I swear that he took the singular parking spot furthest from the entry gate. Luckily we had had too much fun to care. We piled in the car and left DC at about 11:50, and I didn’t get home until after 1. 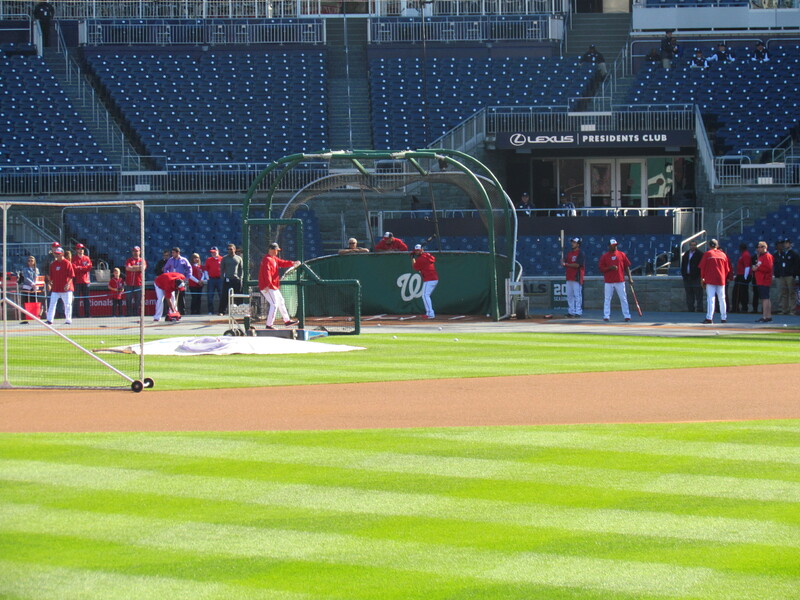 But the 7 hours at Nationals Park were so much fun! Hopefully we can do it again sometime before we all head our separate ways this summer.